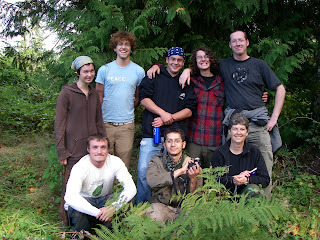 Last week kicked off the first week of the very first Alderleaf Wilderness Certification Program. The week was one of introductions. Introductions to each others, introductions to the school, and introductions to the subject matter. We covered a lot of issues like school educational philosophy, personal introductions, syllabus overview, and campus history. Its interesting, the extent to which, a rough understanding of a region's natural history can cement your sense of place. We did cover a few practical issues, particularly around hazards. We talked about knife safety, bear/cougar attacks, falling branches (widow makers! ), poison plants and water quality issues. I was very interested to learn about the falling branch situation, I had never heard of that before. Cottonwoods and alders are not to be trusted! We did a basic fire building exercise, just to get a gauge on our ability to make a basic fire with matches. I think everyone did well. Today started getting into someone of the meaty goodness that I had been looking forward to. The importance of being a good naturalist was really stressed, as being a good naturalist is the foundation for being good at all other wilderness activities (tracking, survival, etc). We covered basic taxonomy and dabbled a bit in natural history and field skills. Having a liberal arts background makes repeating the basics of science very important for me. It was all very interesting. We then took this thing called the "tourist test". Which is, apparently, another way of saying "the worst test scores taran has ever had". The test was broken into two pieces that roughly correlate to animals and plants. The first section was a series of slides and sound clips showing animals. We then had to write down the specific (yellow bellied marmot, not just marmot) species shown or heard. The second section was on the property identifying tagged plants. I got destroyed on both sections, scoring 22/50 and 12/40 respectively. It was a very sad day, but lots of fun. It will serve as a great gauge for progress throughout the year. I am already determined to do far better next time around! After the tourist test we were given a "sit spot" assignment. This is a place on the property that we choose as our personal grove of naturalist study. We are going to spend 20-30min a day there and record the changes over the seasons. I found the PERFECT spot. It was nice and dry under two hemlocks(? ), surrounded by red huckleberry and ferns. Unfortunately, a hive of yellow jackets has similar feelings about the spot. So I will be locating a new one when I get back to campus on Tuesday. Thankfully, the property is large and interesting enough to have ample opportunities for other spots. The introduction to survival was great. This was really getting into territory I knew nothing about. We spent some time covering the different kinds of "wilderness survival" ranging from modern emergency survival to wilderness living skills. I think what interests me the most is wilderness living skills. I am quite interested in not dieing in an emergency, but the ability to actually thrive in non-human environments is what really excites me. Jason broke down all the major factors that go into wilderness survival, basic priorities, and the necessary mental attitude. We then went into more detail covering the considerations and approaches to shelter, water, fire, wild foods, and survival kits. Now, I am not a huge gear fiend but this got me kind of excited. I really want to throw a kit together now. Once you start learning, even the basics, you really get into it. I want to assemble all this gear, try out new options, add stuff in, etc. The last major project of the day was building bowdrill kits for making friction fires. I cannot verbally express the joy of making a friction fire. Jason provided us with the hardware store ingredients for a friction kit. Now, I realize that this is not nearly the same thing as doing it from gathered gear in a survival situation, but it was disturbingly rewarding. 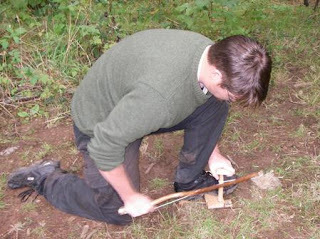 I now have a bowdrill kit that I know how to use to make fire! I am going to slowly swap out store bought bits for gathered pieces. I feel like I have developed some mild form of pyromania. All in all, a fantastic first week.